Difference between revisions of "How To Convert a UserBase Manual to Docbook"
* Check if every page has its header according to the level of this page in table of contents. * Check if every page has its header according to the level of this page in the table of contents. The current process is not polished, the script code is ugly, not intelligent enough, etc.. The only excuse is that it works somehow . Check if every page has its header according to the level of this page in the table of contents. Re-export XML from UserBase. See Export section. Check the docbook, rename the file into index.docbook and commit it with screenshots into your repository. Usually, there is no need to convert DocBook manually. 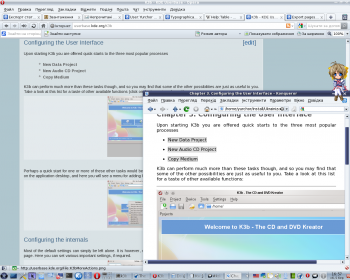 You can download the converted PDFs from KDE Documentation site. Make sure that you have some LaTeX distribution installed (usually, TeXLive). # add -d to command below to keep the /tmp folder, so you can examine the generated tex. Copy KDE styles (/dblatex-cvs-install/share/dblatex/latex/contrib/) to some TeX dir where it can be found by LaTeX installation (I have copied them to /usr/share/texmf-dist/tex/latex/kde). Update paths with mktexlsr from root. Run ./buildpdf.sh index.docbook. This should create ready-to-use PDF file for you. You can stop on this step if you do not want to tweak it. Copy all files from /tmp/tpb-your_user-digits to the work directory. Customize and edit tex file in Kile as appropriate. Compile PDF file with Alt + 6. Make sure that Calibre is installed in your system. Convert your DocBook into HTML first. Use meinproc4 index.docbook for this. Start Calibre and choose Add books. 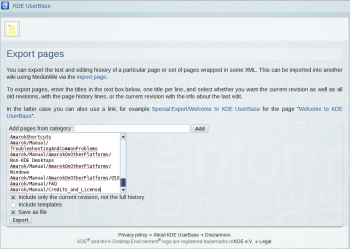 Select index.html in your DocBook folder. Wait until the book is loaded. Fill the metadata fields as appropriate. Press OK and wait until the work is done. 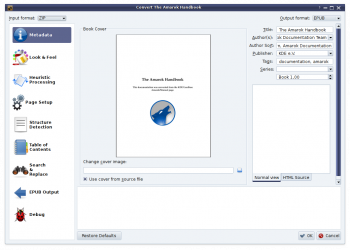 Copy the book from ~/Calibre Library on your ebook reader.